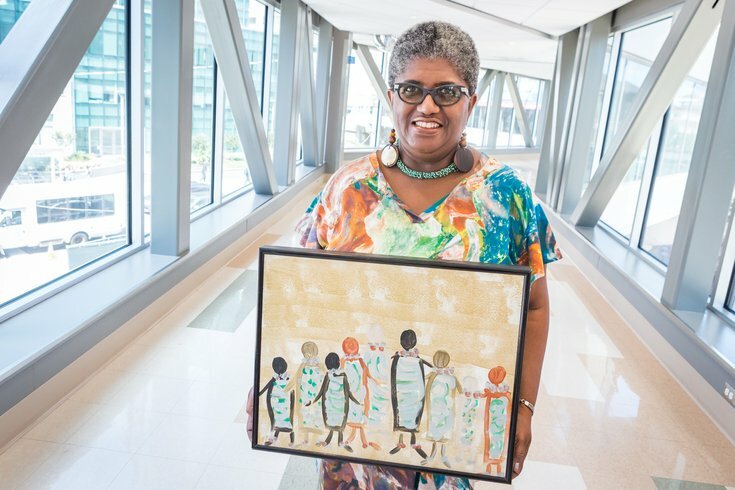 Renee Mills, an administrative secretary in the nursing department at the Hospital of the University of Pennsylvania, is a painter and artist-in-residence. Here, Mills holds her painting, "Unity," while standing on the bridge above Civic Center Boulevard connecting the hospital to the Perelman Center for Advanced Medicine. Renee Andrea Mills, an administrative secretary in nursing administration at the Hospital of the University of Pennsylvania, believes in the power of the arts, and that everyone should have access to it. Unfortunately in the inner city though, a lot of families, particular kids and teens, are never really exposed to the arts. Art and music classes are always the first to go when there are budget cuts in public schools. Her concern: how will they ever know if they have a special talent for art if they never take a class? It was this desire for everyone to have access to art and other creative outlets no matter where they lived that became the impetus for her art workshops. An artist herself since she was a kid, Mills’ favorite media are water colors and acrylic paints on canvas. Her father and his father were artists, too. She and her dad would walk around drawing profiles at family gatherings. “I still have the pencil sketch of my grandmother and me embracing one another while we were sitting at the dining room table. I was about 5 or 6 years old,” she says. She also enjoys creating wearable art, making toaster and light switch covers, and has sold some of her pieces at various arts and craft shows. Mills, 58, first started sharing her love of art when she taught her daughter’s Daisy Girls Scout troop how to create their own rendition of the African Fertility Doll. Then when her daughter became a part of the after-school program at the Wissahickon Boys and Girls Club, she taught Young Artist Entrepreneurship classes, helping the children learn how to create, exhibit and market their artwork. At a leadership training program in 2009 at the Children’s Hospital of Philadelphia, where she met the director of the Homeless Health Initiative outreach program, she decided to create an “artist-in-residence program” for children and teens in shelters. Since then, she has held workshops at Project Home on Saturdays and volunteered for Forget Me Knot Youth Services and the Youth Emergency Services. Over the past few years, on Saturdays for about four hours, she has taught art workshops at the Unitarian Universalist Church’s social hall in East Mount Airy. “It was different from the other classes I have taught because I gave them copies of photos of different African masks and asked them to depict their own interpretation of the mask. Each painting was very unique,” she says. She has also held "Painting without a Twist" classes for seniors at the Triumph Baptist Church. “The last class I held there we set up outside and painted in a nice area on the church grounds,” she says. Mills, who lives in East Mount Airy, is currently setting up art classes for the fall at the Woodstock Family Center Shelter through the City of Philadelphia’s Office of Homeless Services. Meanwhile, she has been accepted into the online master’s degree program at Villanova University, where she is pursuing a master’s degree in public administration. 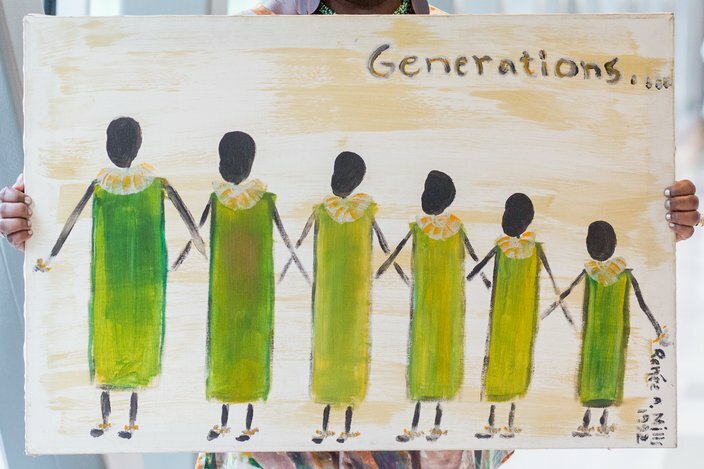 Renee Mills holds her painting titled “Generations.” The arts are “such good therapy for the mind, soul and spirit,” she says. Being involved in the community is very important to Mills, and she likes to help out any way that she can. She is even developing her own nonprofit organization. If you’d like to learn more about her art workshops, you can contact her at artbyram12@gmail.com.